My Alibaba, The experience with difference. Description of "My Alibaba - The experiences of working at Alibaba"
This book is a summary of my journey and observations while working at Alibaba and living in China. I led few international roles for Alibaba managing product plans, budgets, marketing and business development from 2010 for over 5 years. The author has worked at Alibaba Group, in China leading few international business units and witnessed the complete project cycles from ideas to success working with Chinese and international team members. While doing this he also experienced many interesting facts and dynamics of Chinese people, cultures as well as some eye opening and innovative ways people at Alibaba are oriented to build a larger global play. The author also got a chance to witness various successes like largest IPO Alibaba group did in 2014, the singles day shopping phenomenon breaking many records of e-commerce too. 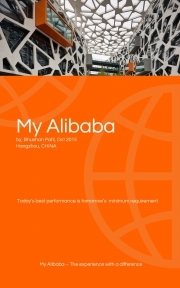 Reviews of "My Alibaba - The experiences of working at Alibaba"